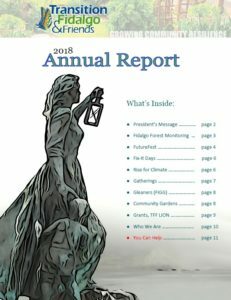 Transition Fidalgo and Friends recognizes the key role of fossil fuels in powering our transportation, providing heat and electricity in our homes and businesses, and in making most things we use possible. The energy derived from using fossil fuels has allowed many societies around the world to enjoy the highest standard of living in human history. However, these advances have come at a high cost. Environmental impacts associated with extracting, transporting, and using fossil fuels have escalated to the point where human health and the health of all species is in jeopardy. Our unrestricted use of fossil fuels has created a perilous outlook for future generations. There are other impacts beyond environmental. Many countries around the world have seen their governments and their people’s livelihoods destabilized or destroyed in the pursuit of fossil fuel resources. Clearly, the continued use of fossil fuels is not sustainable. Transition Fidalgo and Friends urges its members and the world at large to view the use of fossil fuels as a temporary bridge to developing the technologies and lifestyles that support a renewable energy future, a future that is in balance with the ability of the planet to regenerate. The sooner this transition can be accomplished, the sooner we can stop using fossil fuels and begin to reverse the damage that has been done to our planet. In this effort, the role of Transition Fidalgo and Friends’ is not to actively campaign against the use of fossil fuels, but to educate as to the peril of their continued use and to vision and work toward a positive, low-carbon future.